Not since Aaron’s notorious idol misjudgement on Mount Sinai has a life-size aureate bovine caused quite such a stir. 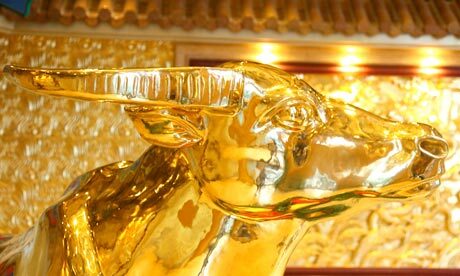 Jiangsu Party guy Wu Renbao’s decision to install a £31m solid gold statue of an ox on the 60th floor of rural Huaxi’s new 1,076ft supertower has been branded a gross extravagance by some, particularly as many of the farmers who live in its shadow earn low wages. Villagers have reportedly started a helicopter business to give visitors a better view of the tower – which could be seen as indicative of the sort of Wu-instilled entrepreneurial zeal that has made Huaxi one of the richest villages in China and led to him to be decorated as a “Top National Contributor to Poverty-Alleviation”. However I am not convinced of the long term economic rewards of skyscraper one-upmanship. I just went to see Xu Bing‘s (徐冰) excellent installation at the British Museum. 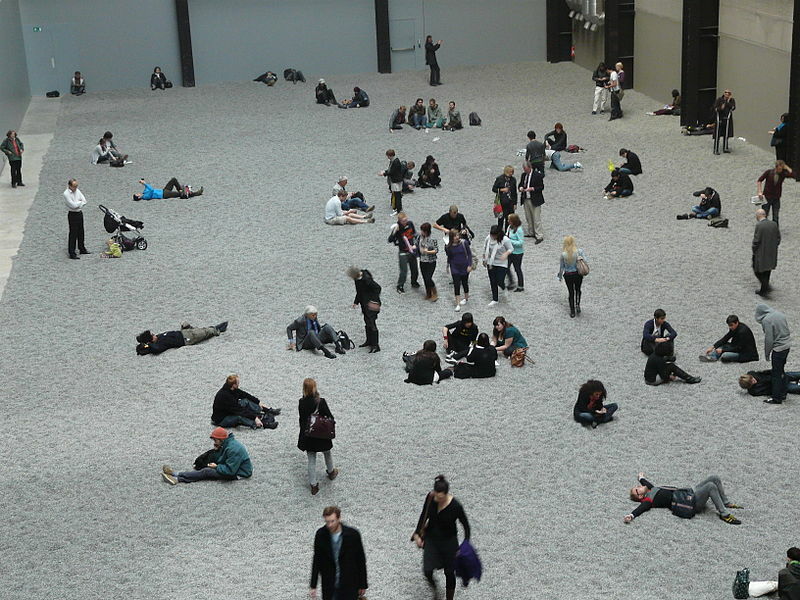 Xu Bing is a contemporary Chinese artist and has been described as a member of the Chinese avant garde movement. The installation in the British Museum is an innovative “shadow painting” copy of a Wang Shimin 王時敏 piece from 1641. Wang was one of the “four Wangs”, who make up four of the Six Masters of the early Qing period (清六家) : Yun Shouping, Wu Li and the Four Wangs: Wang Shimin, Wang Jian, Wang Yuanqi and Wang Hui. In the installation Xu Bing uses discarded leaves (from Kew Gardens), old newspapers and twigs to create a shadow image of a classic Chinese landscape (山水). Xu Bing is famous for much of his work playing with language, including a book with over 4000 different characters which are entirely original and of his own making. Here he has written the nursery rhyme Jack and Jill: look carefully and you can read it!